We’re on a mission to create young empowered leaders. Create change is primarily run by volunteers. We attract energetic people who are motivated by the desire to create meaningful change in their communities as well as internationally. Our volunteer opportunities offer a variety of ways to grow personally and professionally. Whether you’re a student or a professional wanting to give or gain some experience in a hands-on capacity, we invite you to explore an opportunity with our team. While we often post specific volunteer positions, please share your interest in being a change-maker with Create Change at any time! Our Youth Change -Maker programs are dedicated to sparking the belief in young people that they can be powerful agents of change. They offer a real-world, hands-on opportunity to learn how to run a business that has a positive impact in the world. Skills learned through the various programs we offer are invaluable to students no matter which direction they pursue in life. For students in grades 10 – 12, this foundational program teaches students the fundamentals of marketing. 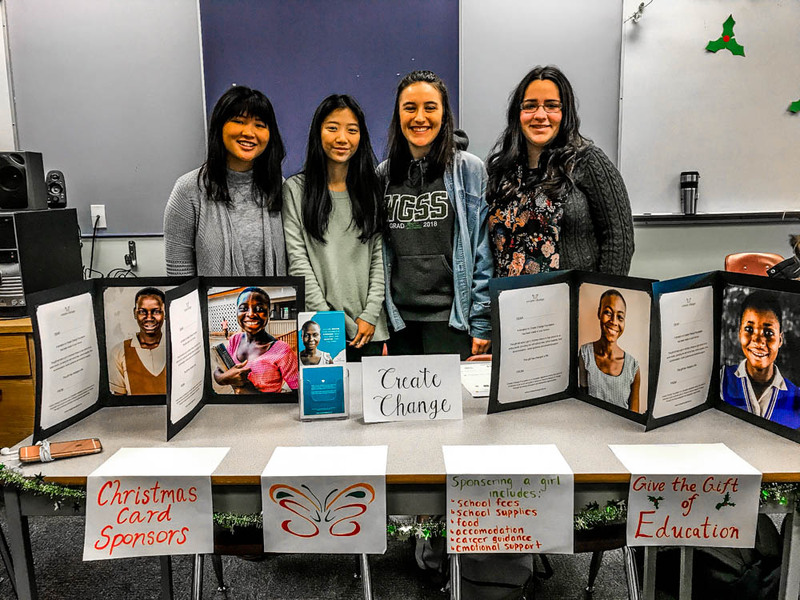 Students develop fundraising campaigns that impact the lives of impoverished girls their own age. The program teaches an extensive skill set in marketing, communications and fundraising, while also building confidence and the belief that people can be powerful agents of change at any age. The Operation Charity program provides students with the opportunity to participate in Create Change's formal operations, through both paid and volunteer opportunities. Students gain real world experience running a charity, and have the opportunity to be mentored by local professionals in one of the following fields: events, communications, donor relations, product sales and corporate sponsorship. The Marketing for Change Program is a prerequisite. The inspiring story of our Marketing for Change teams becoming effective change-makers in their communities. How Killarney Secondary School's Create Change team changed the life of a girl during one lunch hour. Grade 10 student Sarah Li discusses how her team learn to overcome rejection to educate girls in Ghana. Volunteer in Ghana with us through our partner social enterprise 'Field School'. We can accomplish so much more with you as a partner. Consider how your business could offer funding for our developing enterprises. We are proud that several local entrepreneurs have helped launch five social enterprises to date, and many business owners offer donation matching in support of our local youth program to encourage youth to increase their impact. Be a change-maker – donate or sponsor a program today or talk to us about other possibilities. We’re grassroots… always open to innovative ideas, and opportunities to collaborate with people and businesses in our community.